The Marx Brothers' greatest and funniest masterpiece - the classic comedy Duck Soup (1933) is a short, but brilliant satire and lampooning of blundering dictatorial leaders, Fascism and authoritarian government. The film, produced by Herman Mankiewicz, was prepared during the crisis period of the Depression. Some of its clever gags and routines were taken from Groucho's and Chico's early 1930s radio show Flywheel, Shyster & Flywheel. Working titles for the film included Oo La La, Firecrackers, Grasshoppers, and Cracked Ice. It was the Marx Brothers' fifth film in a five-picture contract with Paramount Studios, before they went on to MGM. It was their last and best film with the studio. The film was directed by first-class veteran director Leo McCarey (who would go on to direct The Awful Truth (1937), Love Affair (1939), Going My Way (1944), and An Affair to Remember (1957) - a remake of his 1939 film), and its screenplay was written by Bert Kalmar and Harry Ruby (with additional dialogue by Arthur Sheekman and Nat Perrin). Originally, it was to have been directed by Ernst Lubitsch. The film was devoid of any Academy Award nominations. The outrageous film was both a critical and commercial failure at the time of its release - audiences were taken aback by such preposterous political disrespect, buffoonery and cynicism at a time of political and economic crisis, with Roosevelt's struggle against Depression in the US amidst the rising power of Hitler in Germany. (This film quote, spoken by Groucho, was especially detested: "And remember while you're out there risking life and limb through shot and shell, we'll be in here thinking what a sucker you are.") Insulted by the film, fascist Italian dictator Mussolini banned the film in his country. Fortunately, the film was rediscovered by a generation of 1960s college students, and by revival film festivals and museum showings. As a result, the film has attained immortal status. This was the last of the Marx Brothers films to feature all four of the brothers. Their next film (without Zeppo), for MGM and its producer Irving Thalberg, Hollywood's most prestigious studio, was their landmark film A Night at the Opera (1935), with a more developed and polished plot-line. The mirror routine, contributed by McCarey, had been used by Charlie Chaplin in The Floorwalker (1916) and by Max Linder in Seven Year's Bad Luck (1921). It was later replicated in a Bugs Bunny cartoon, re-enacted by Harpo with Lucille Ball on a 1950's "I Love Lucy" show episode, and also appeared as part of the opening credits for the 60s TV series "The Patty Duke Show". Actor/director Woody Allen paid homage to the film in his Hannah and Her Sisters (1986) - with an excerpt from the musical number "The Country's Going to War." While attending an afternoon screening of Duck Soup at his local repertory movie theater, one of the film's characters - a depressed and neurotic NY Jew named Mickey Sachs (played by Allen himself), who is afraid of disease and dying - experiences a climactic epiphany that life was meant to be enjoyed, by narrating: "And I started to feel how can you even think of killing yourself? I mean, isn't it so stupid?..." Why the title Duck Soup? [Earlier in 1927, director Leo McCarey had made a two-reel Laurel and Hardy film with the same title - and he borrowed the title from there.] The film's title uses a familiar American phrase that means anything simple or easy, or alternately, a gullible sucker or pushover. 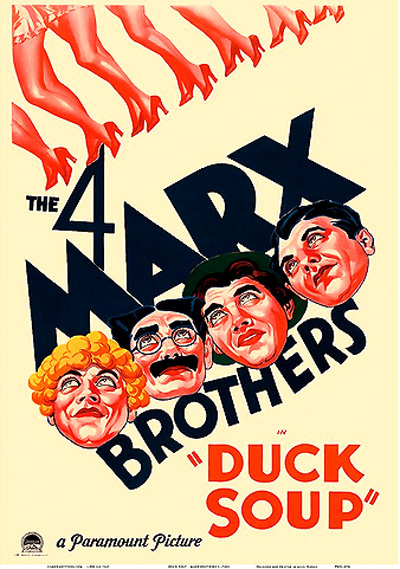 Under the opening credits, four quacking ducks (the four Marx Brothers) are seen swimming and cooking in a kettle over a fire. Groucho reportedly provided the following recipe to explain the title: "Take two turkeys, one goose, four cabbages, but no duck, and mix them together. After one taste, you'll duck soup for the rest of your life." The government has been mismanaged. I will lend the money, but only on condition that His Excellency withdraw and place the government in new hands. The opening scene is the classic inaugural ceremony and lawn party for the conferring of the Presidency of the tin-pot republic to a newly-appointed leader, Rufus T. Firefly (Groucho Marx), characterized by a supportive Mrs. Teasdale as "a progressive, fearless fighter." She vows: "I will lend the money to Freedonia only if Firefly is appointed leader." Headlines in the Freedonia Gazette read: "FIREFLY APPOINTED NEW LEADER OF FREEDONIA." A sub-article reads: "Mammoth Reception Arranged to Welcome Nation's Leader Tonight - Selection of Rufus T. Firefly Greeted with Cheers of Freedonians." Trentino: I've given up the idea of a revolution. I have a better plan...I can gain control of Freedonia much easier by marrying Mrs. Teasdale. Vera: Ha, ha, ha. Maybe that's not going to be so easy...From what I hear, you see, Mrs. Teasdale is rather sweet on this Rufus T. Firefly. Firefly's secretary Bob Rolland (Zeppo Marx, in his LAST Marx Bros. film) arrives and assures Mrs. Teasdale, in song, that the absent statesman will appear "When the Clock on the Wall Strikes Ten." When the clock on the wall does strike ten, pretty dancing girls scatter rose petals and kneel in homage between an impressive lineup of helmeted, sword-bearing guards along the entrance way with swords uplifted. The assembled audience sings the national anthem "Hail, Hail Freedonia," but Firefly isn't anywhere in sight. After a long pause and a trumpeters' fanfare, the anthem is sung a second time and all the guests look toward the entrance, but Firefly still fails to enter. Suddenly, in an upstairs bedroom, the ringing of an alarm clock is heard, and Firefly appears in bed with a nightshirt, nightcap, and cigar. He quickly removes his nightshirt to reveal a suit, and slides down an unlikely fireman's pole into the spacious ballroom hall. He takes his place in the line-up with his own honor guard at the end of the ceremonial line, joining them to wait for his own arrival and holding out his cigar with their swords. He asks one of the guards: "You expecting somebody?" Firefly: Never mind that stuff. Take a card. Firefly: You can keep it. I've got fifty-one left. Now what were you saying? Mrs. Teasdale (with high regard): I've sponsored your appointment because I feel you are the most able statesman in all Freedonia. Firefly (insulting her): Well, that covers a lot of ground. Say! You cover a lot of ground yourself. You'd better beat it. I hear they're gonna tear you down and put up an office building where you're standing. You can leave in a taxi. If you can't get a taxi, you can leave in a huff. If that's too soon, you can leave in a minute and a huff. You know, you haven't stopped talking since I came here. You must have been vaccinated with a phonograph needle. How do you like that? I haven't been on the job five minutes and already she's making advances to me. Mrs. Teasdale: Oh, I want to present to you Ambassador Trentino of Sylvania. Having him with us today is indeed a great pleasure. Firefly: That's even a greater pleasure. Now, how about lending this country $20,000,000 dollars, you old skinflint. Trentino: $20,000,000 dollars is a lot of money. I'd have to take that up with my Minister of Finance. Firefly: Well, in the meantime, could you let me have $12 dollars until payday? Firefly: Don't be scared. You'll get it back. I'll give you my personal note for 90 days. If it isn't paid by then, you can keep the note. Trentino: Your Excellency? Haven't we seen each other somewhere before? Firefly: I don't think so. I'm not sure I'm seeing you now. It must be something I ate. Trentino (insulted): Look here Sir, are you trying to...? Firefly: Don't look now, but there's one man too many in this room, and I think it's you. I could dance with you till the cows come home. On second thought, I'd rather dance with the cows when you came home. Firefly dictates a letter to his dentist in the middle of the inauguration. Mrs. Teasdale congratulates him on his coronation and sovereignty: "The eyes of the world are upon you. Notables from every country are gathered here in your honor. This is a gala day for you." He replies: "Well, a gal a day is enough for me. I don't think I could handle any more."